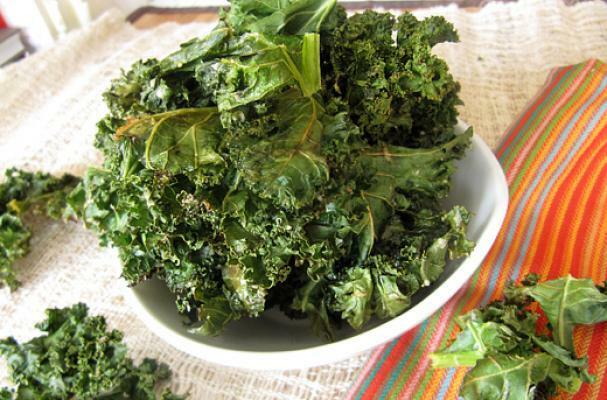 Kale is my go to vegetable all year round. Especially in the wintertime, when seasonal fresh food is scarce, kale just keeps growing all winter in a coldframe or greenhouse. Even if you have to buy it (as I often do, since using such a great amount all the time), it ranges from $1.00 to $1.20 a pound. It's a very inexpensive healthy food. We eat this healthy veg almost every night, and I admit to eating every single day and sometimes twice a day. It truly is a powerhouse of nutrition that can be dressed up many different ways. Here is a recipe that is kid friendly, but watch out! It is also very addictive. Before you know it, you too will be offering friends a bite of this yummy snack.